“They’re like screen doors for a submarine.” That’s how Charles Trafton, a managing partner at Flowpoint Capital, described federal student loans at a recent panel at ASU GSV Summit 2018. The panel focused on a simple question: “Can income share agreements (ISAs) transform the cost and return-on-education?” The answer, for Trafton and panelists David Cooper (Purdue), Tonio DeSorrento (Vemo), and Martha Kanter (College Promise Campaign), was a resounding ‘probably.’ DeSorrento went so far to say that, within five years, roughly have of the 20 million postsecondary students in the U.S. to have ISAs as an option for funding their education. Income share agreements, in this context, are an alternative way to pay for college. An ISA agreement might go something like this: a student receives a given amount of funding to cover some (or in other cases, all) of their college tuition. After they graduate, and get a job, they pay a percentage of that income back to the college. If they get a high paying job, they end up paying a lot, and vice versa. The agreement expires after a given amount of time, usually five years. ISAs also do not accrue interest. Still, income share agreements won’t make sense for everyone. Purdue caps their total payment at 2.5 times what was initially awarded to a student. That means that, if you end up earning a large salary out of college, you might end up paying much, much more than you would if you had taken out a loan. Still, the typical college graduate won’t fall into this category. Purdue became the first major university to offer income share agreements in 2016. Since, many other institutes of higher learning, capital investment firms, and others have begun to test out the feasibility of ISAs. 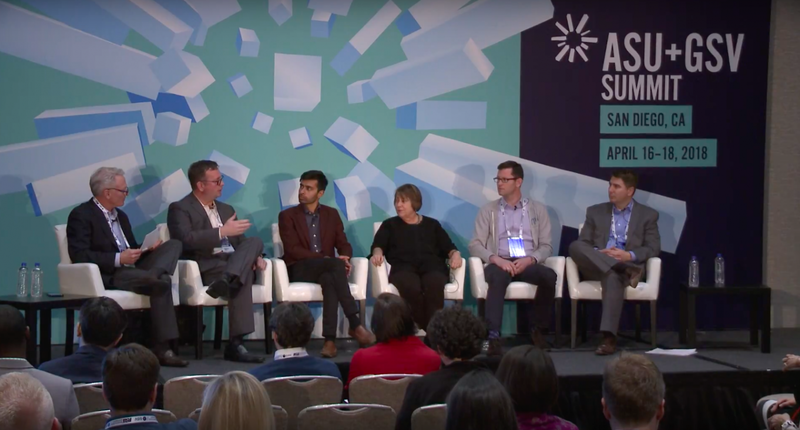 As evidenced by the recent ASU + GSV Summit panel, many are optimistic. One of the main criticisms of ISAs today is that they are largely unregulated. In 2017, Congress introduced two bills. The first would have capped the maximum amount a student could repay. The second would have banned colleges from collecting on a student’s income that falls below the poverty line. Neither made it out of the committee stage. Protecting students is always a concern, especially those who stand to gain the most from ISAs (namely learners from lower-income families). Some have even likened the agreement to indentured servitude. But according to Trafton, the federal government has already gotten into the ISA market. But there’s another hitch standing in the way of widespread adoption: different programs result in different salaries. “In order for us to place a financial value on these schools, we have to know what happens when people leave,” Trafton said. In a climate where the rising availability of federal loans have driven up the cost of college education, ISAs stand as a potential cure for the fever. Cover Image: Global Silicon Valley.